Home / Team Management & Groups, Teams / What’s the difference between Teams and Agent Groups, and which should I use? In Helpshift, you can structure your support organization using Teams, Agent Groups, and role assignments. Teams is designed for large support organizations which are divided into specialized groups. You can give each Team operational independence by defining separate Admins, Supervisors, and Agents for each Team. Teams that are split up geographically, with each office location being one Team. User management can be controlled by the local Supervisor. Teams that are organized by function (Trust and Safety, Operations, Support) can have performance tracked via Analytics. Teams which consist of outsourced Agents who may have different SLAs, skills, and permission sets. If you do not have Teams enabled on your Dashboard, you’ll only see one Team listed in the ‘Teams’ area, which includes everyone in your Dashboard as members. You can organize your Team into Agent Groups. Groups enable you to manage different tiers of support and improve team efficiency when responding to large volumes of Issues. You can use Groups with Smart Views and Queues to organize Issues by category for your Agents to handle. You can further organize your Team or Agent Group with our 3-tiered role structure consisting of Agents, Supervisors, and Admins. Admins can toggle select permissions to grant additional functions to Supervisors and Agents. The permissions available to be toggled on/off for those team members are available on the Settings > Permissions page of the Admins Dashboard. What is the hierarchy of your support team? Review the functions of each Helpshift role against the responsibilities you’d like the different roles in your team to have. For example, if you have team leads for each of your specialized groups, you may wish to define those leads as supervisors. How do you currently organize your support team? By language, tier, specialization, app, etc. It’s best to define a team in Helpshift that mirrors your current team’s organization. Based on your company’s roadmap, do you foresee the need to restructure your team in the near future? For example, if you currently only need to offer iOS support but may need to hire Android specialists after a future product release, it’s important to consider how to plan to reorganize your team for this change. Is everyone in your team cross-trained (able to address all different types of Issues), or do they only specialize (Issue type, language)? This is important when considering what types of permissions and visibility to allow. 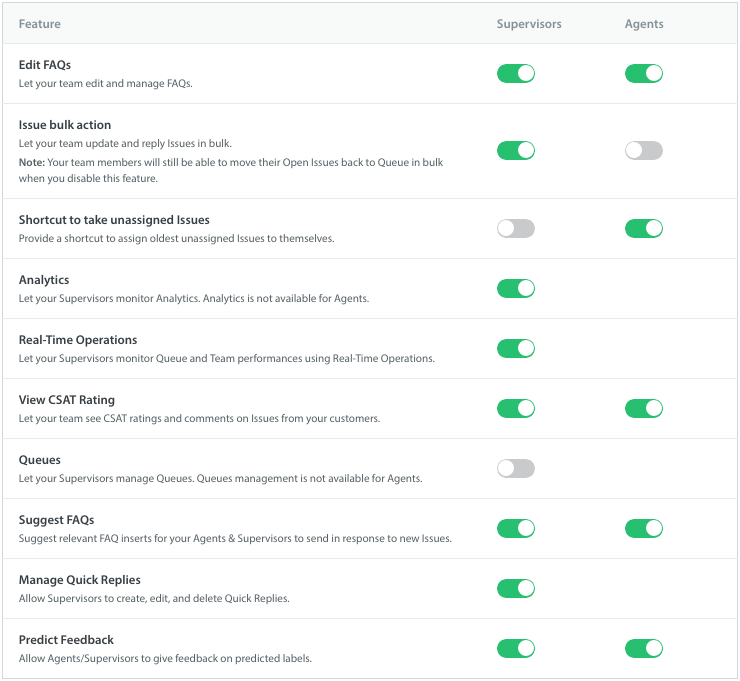 Once you’ve appropriately set up your Teams and Agent Groups and defined your team members roles, you’re ready to integrate our workflow features to route Issues to your team.